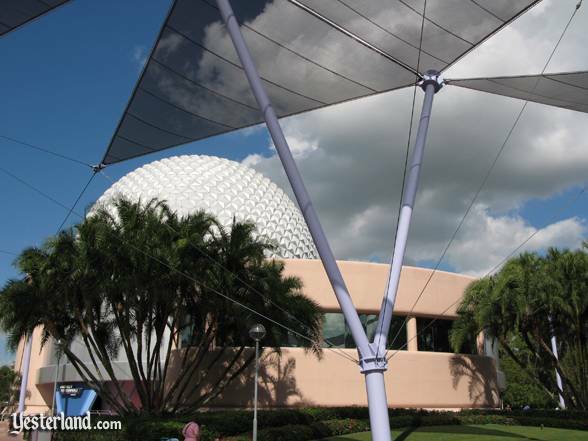 While at Epcot in 2008, I noticed that Future World had had many subtle changes in just a few years. I took a third look last month. 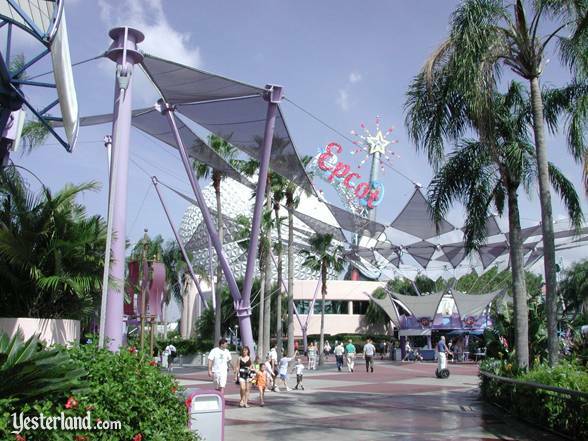 Here’s part 1 of a 2-part article comparing photos of Future World in the early 2000s, 2008, and 2015. 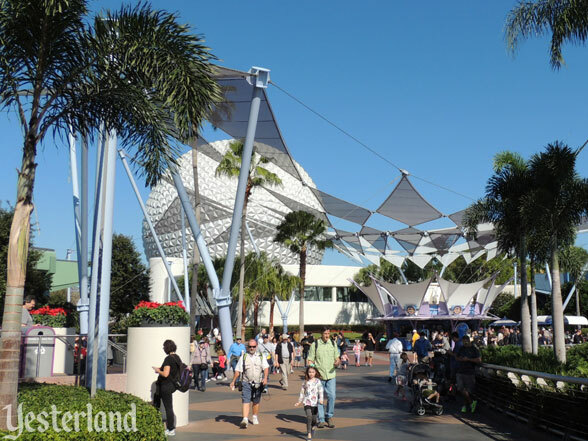 In the trio of photos above, only the first one shows the Mickey Glove and Wand Icon Tower, originally installed in 1999 for the Millennium Celebration. This aberration is mercifully gone in the other two photos. 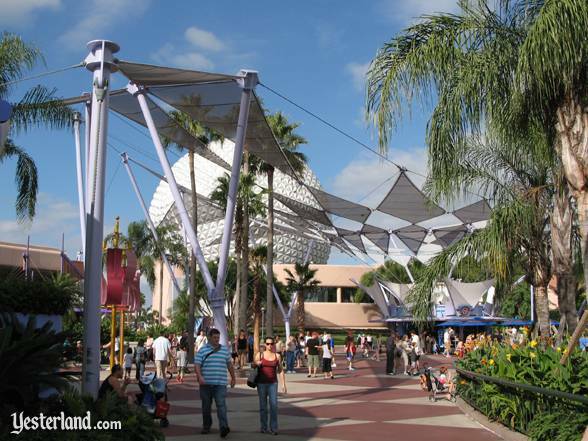 The suspended triangular and kite-shaped “shade” awnings (which don’t provide any real shade) and the massive, angled poles that support them are still left over from the Millennium Celebration. 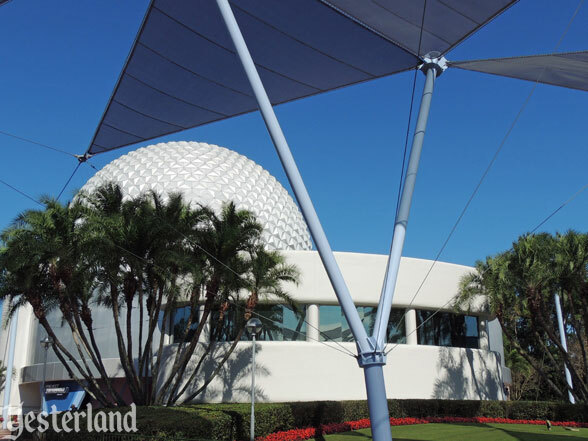 Perhaps, some day, the awnings and poles will be removed so that the focus of the Innoventions Plaza can once again be the elegant sphere of Spaceship Earth at one end, the magnificent fountain at the other end, and the graceful, curved buildings on either side. 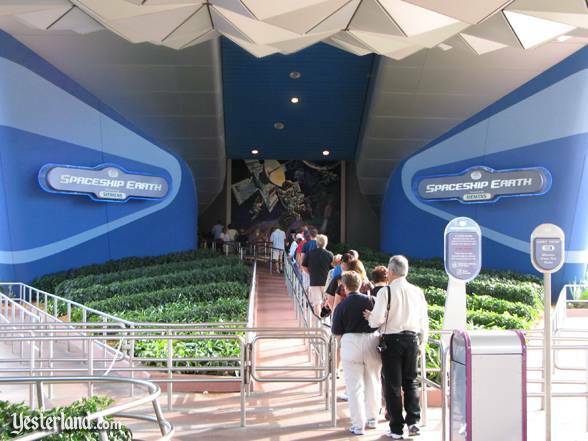 After Siemens signed on as the sponsor of Spaceship Earth in 2007, the attraction’s entrance received new landscaping, a new paint scheme, and new signs. Cool gray and white and an updated font on the newer sign replaced the orange text on the older sign. 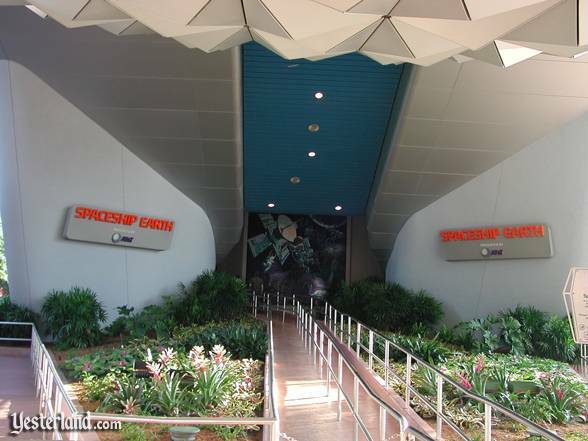 Interestingly, Disney kept the space mural, which goes back to the opening of EPCOT Center in 1982. It’s a majestic mural that has aged gracefully, and it works just as well with Siemens’ message of innovation as with AT&T’s message of communication. 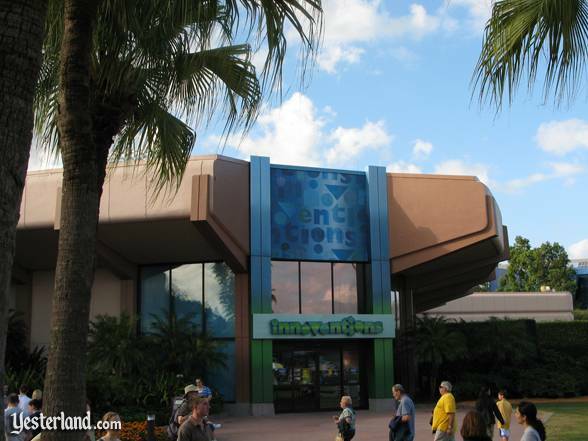 The three photos above show the same entrance to Innoventions—the one that you encounter after entering Epcot and taking the path on the right side of Spaceship Earth. 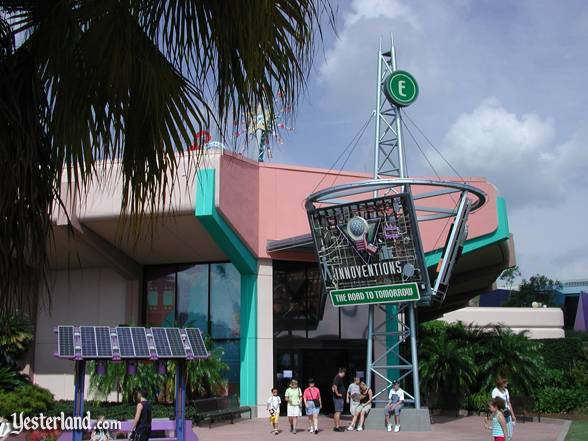 When Innoventions replaced Communicore in 1994, Disney erected sign towers which clashed with the architecture of the central Future World buildings. 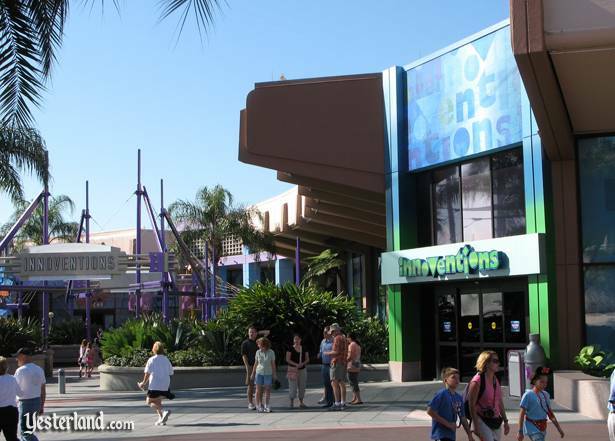 Around the time of Epcot’s 25th anniversary on October 1, 2007, new, simpler entrances replaced the old towers and graphics. 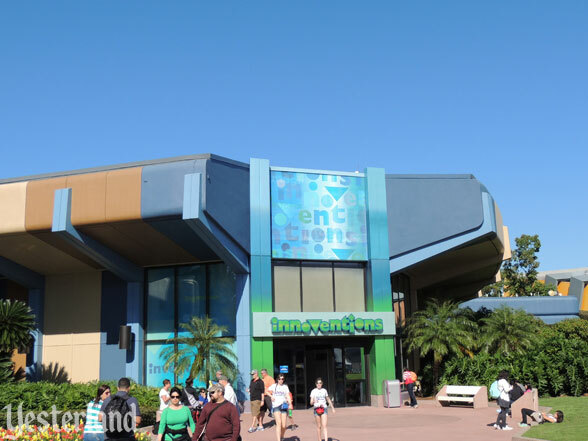 In 2015, Innoventions West lost all its remaining displays, so there are no longer Innoventions signs at its entrances. 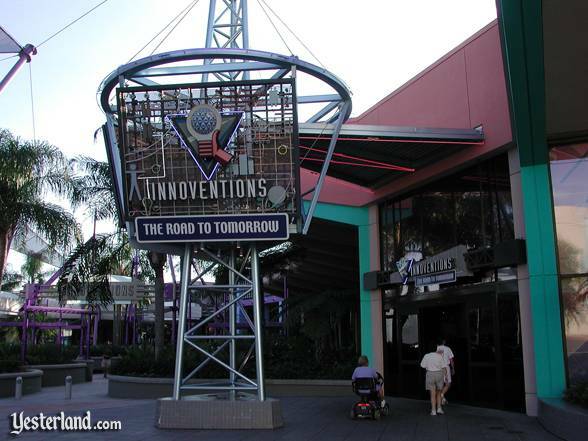 The Innoventions East entrance that faces Test Track (originally World of Motion) is another example of the signage change in 2007. The paint scheme on the building keeps changing. 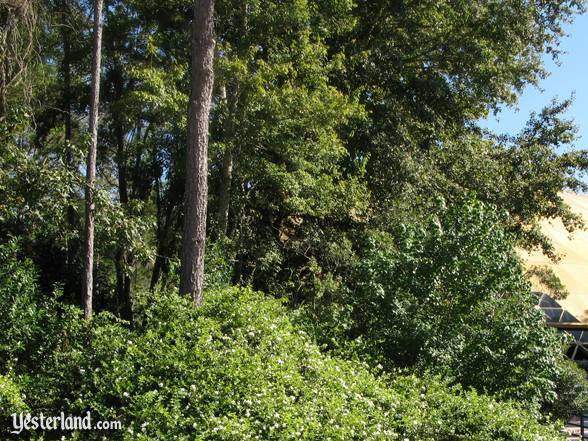 The solar cells in the 2004 photo are gone in the other two photos. 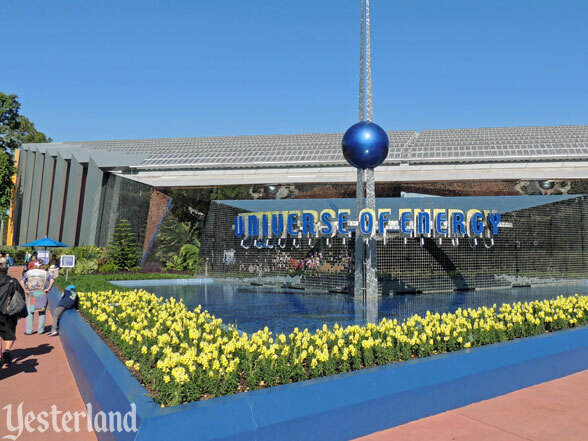 Differences in the three Universe of Energy photos (aside from slightly different camera angles) include the ExxonMobil logo in the first photo, the elimination of the rainbow colors (1996 to 2009) in the third photo, and different seasonal flowers in the planter in each photo. 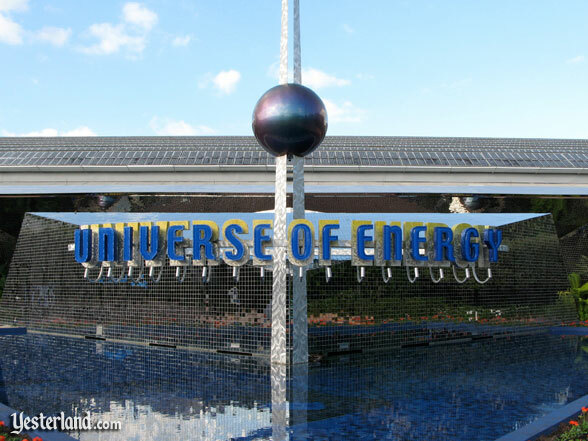 When Universe of Energy opened in 1982, its sponsor was Exxon. 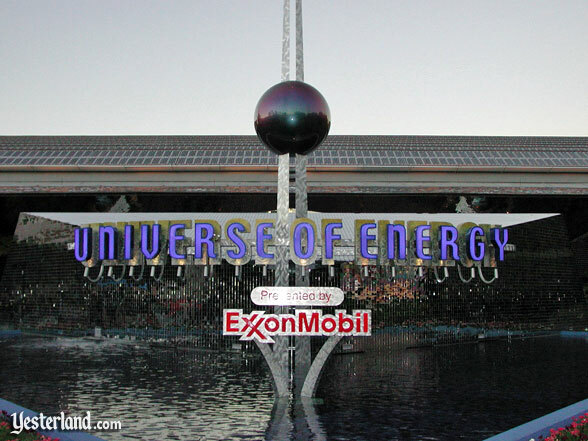 After Exxon and Mobil merged in 1999, the sponsor became ExxonMobil. 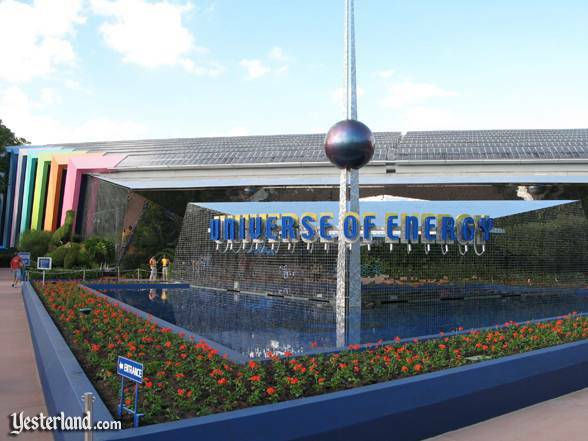 In 2004, ExxonMobil decided not to renew, so the Universe of Energy attraction has operated without a sponsor—and without any upgrades—since then. 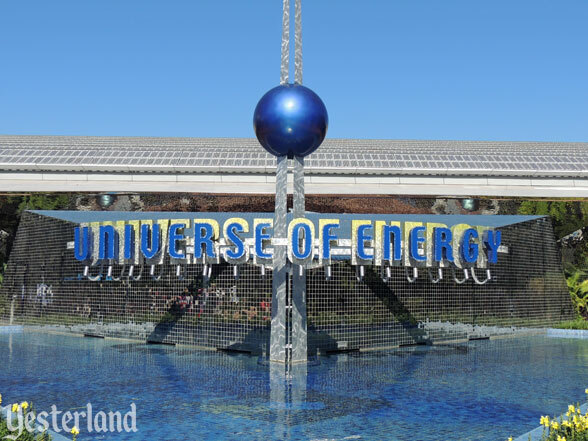 The billboard in the first photo of the trio above advertised Ellen’s Energy Adventure, starring Ellen DeGeneres and Bill Nye the “Science Guy.” Located in a landscaped area between Universe of Energy and Wonders of Life, it looked out-of-place between these Future World pavilions. 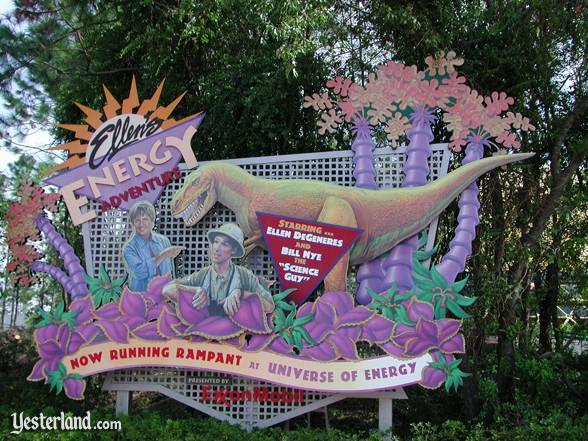 In September 1996, the newer Ellen’s Energy Adventure show replaced the original 1982 version of Universe of Energy, but the pavilion’s name and signage remained the same. 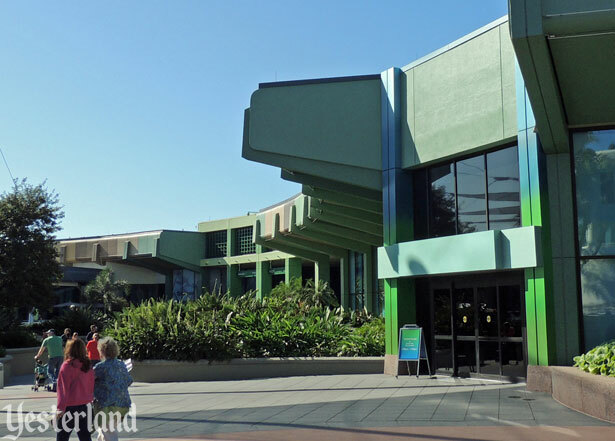 The billboard told guests that a new experience was inside the building, but that Audio-Animatronic dinosaurs were still part of show. Presumably, very few people remember the original 1982 version, and there’s no longer any reason to have a billboard. The “Tower of Life,” a 72-foot representation of a DNA double helix, is gone. 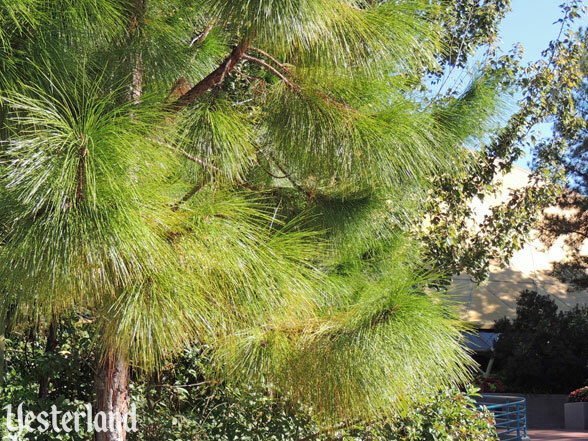 The Wonders of Life sign is gone. 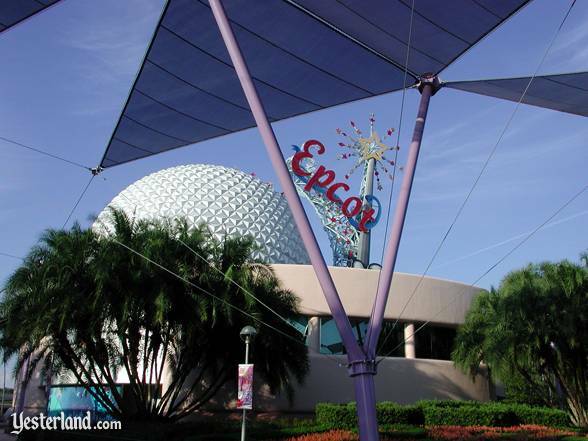 Both came down in August 2007 as Disney prepared for the 2007 Epcot Food & Wine Fesival. 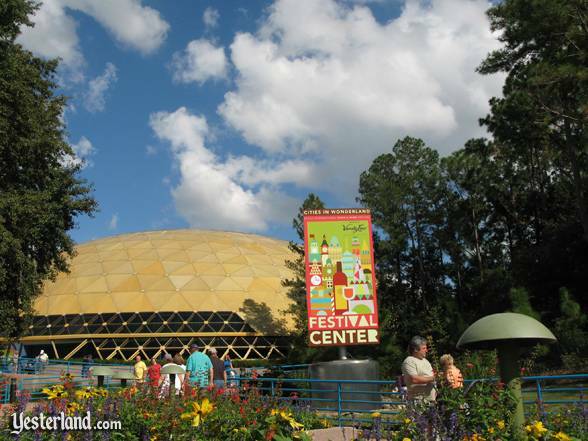 The 2008 photo (taken earlier this month) shows a large sign for the 2008 Epcot Food & Wine Fesival. 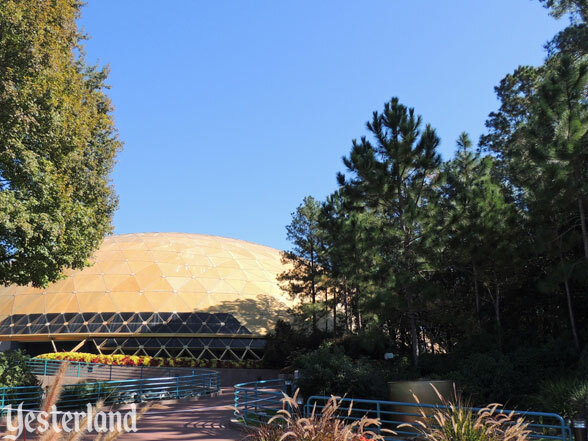 The Wonders of Life pavilion, originally sponsored by MetLife, opened in October 1989. MetLife dropped out in 2001, and no other sponsor took over. 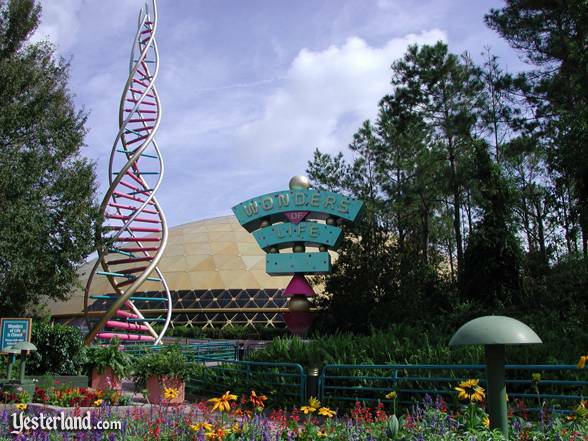 In 2004, 2005, and 2006, the Wonders of Life operated seasonally during the busiest times of the year. 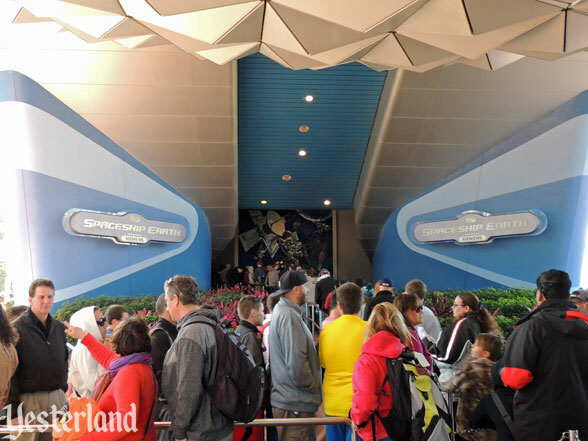 Body Wars and Cranium Command have been unavailable to guests since New Years Day 2007, when the Wonders of Life closed permanently. 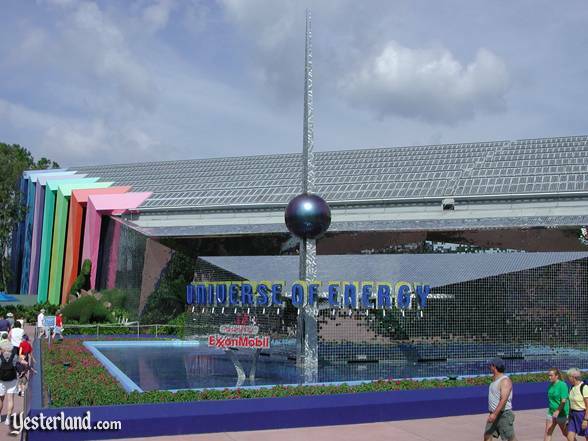 Photos of Future World: Werner Weiss (year shown under each photo).